The United States Congress designated the Mollie Beattie Wilderness (map) in 1980 and it now has a total of 8,000,000 acres. All of this wilderness is located in Alaska and is managed by the Fish and Wildlife Service. Possibly no other region of America has seen less human impact than the northeastern corner of Alaska. 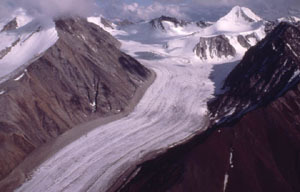 Here the Brooks Range bulges up near the Arctic Ocean to create a unique combination of habitats, including arctic, subarctic, and alpine ecosystems. Elevations rise from sea level in the northern portion of the Wilderness to peaks reaching nearly 9,000 feet. The highest in the Brooks, look northward across rolling tundra cut by serpentine rivers and dotted with clusters of freshwater lakes. Farther north lie the barrier islands and saltwater lagoons of the Arctic Ocean. Southward the terrain drops from treeless mountains into broad conifer-and hardwood-covered valleys including tall spruce, birch, and aspen. By Arctic standards, the Wilderness’s mammal population is abundant: brown bears, moose, wolves, wolverines, and red foxes everywhere; Dall sheep and marmots in the high mountains; black bears, coyotes, lynx, porcupines, and beavers in the forestland; musk oxen and arctic foxes on the north slopes; polar bears on the ice pack; and the 110,000-member Porcupine caribou herd in winter in the southern portion. Beluga and bowhead whales migrate along the coast with ringed and bearded seals. Migratory birds flock here, some traveling all the way from Antarctica. Mollie Bettie Wilderness receives 12.2 inches of precipitation, annually. The warmest temperatures come in July and average between 48 F to 73 F. The coldest temperatures come in January and average between -24 F to -8 F.
Planning to Visit the Mollie Beattie Wilderness? How to follow the seven standard Leave No Trace principles differs in different parts of the country (desert vs. Rocky Mountains). Click on any of the principles listed below to learn more about how they apply in the Mollie Beattie Wilderness.